1) It joyfully imagines a post-binary-gender world in which parents elect to have their children treated, while in the womb, to ensure that they will grow up with a mix of gender characteristics. And it provides a social and economic justification for them doing this. 2) Variations on gender/sexuality are not a main component of the plot exactly but the idea of gender play is fully part of the cultures...not a winner I would think but worthy of a mention perhaps...seems to be an example that fits the intent of the Award: authors that go beyond the present for gender/sexuality. However, it lost to Caitlin R. Kiernan's The Drowning Girl and Kiini Ibura Salaam's Ancient, Ancient. 2312 is still in the Honor List. Robinson had been previously nominated for Red Mars (1992) and his short story "Sexual Dimorphism" (in The Martians; 1999). Where it lost to Adam Roberts' Jack Glass. Robinson had been previously nominated for The Gold Coast (1989), Green Mars (1993), Blue Mars (1996), The Years Of Rice And Salt (2002) and Forty Signs Of Rain (2004) and had won for Red Mars (1992). Where it lost to Chris Beckett's Dark Eden. Robinson had been previously nominated for The Memory Of Whiteness (1987), Red Mars (1993), Blue Mars (1997), The Years Of Rice And Salt (2003) and Galileo's Dream (2010). Which is announced on May 18 (today!) in the Nebula Awards Weekend May 16-19 in San Jose, California, where Gene Wolfe will also receive the Damon Knight Memorial Grand Master Award. Robinson had been previously nominated for The Wild Shore (1984) and Green Mars (1994) and had won for Red Mars (1993). Which will be announced by Connie Willis in the Locus Awards Weekend in Seattle, Washington, June 28-30. Robinson had been previously nominated for The Gold Coast (1989), Red Mars (1993), Antarctica (1998), Forty Signs Of Rain (2005), Fifty Degrees Below (2006) and Galileo's Dream (2010) and had won for Green Mars (1994), Blue Mars (1997) and The Years Of Rice And Salt (2003). Which will be announced June 14 at the Campbell Conference in Lawrence, Kansas. Robinson had been previously nominated for The Gold Coast (1989), Blue Mars (1997) and Galileo's Dream (2010) and had won for Pacific Edge (1991). Which will be announced in the World Science Fiction Convention in San Antonio, Texas (Aug-29 to Sep-02). Interestingly, last time Robinson had won, for Blue Mars in 1997, it was also in San Antonio! Robinson had been previously nominated for Red Mars (1993) and The Years Of Rice And Salt (2003) and had won for Green Mars (1994) and Blue Mars (1997). 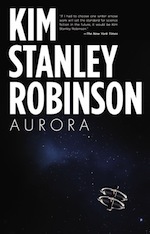 The Barnes & Noble Book Blog: "A Novel to Satisfy the Most Diehard Sci Fi Fans"